As I was walking to the book fair on the 9th, I saw this clock on a building at the corner of State and Jackson Streets. I hadn't noticed it before and I've lived in this area for almost 30 years. I'm pretty sure this is not a recent addition to the building. I can't see anyone putting up an analog clock nowadays. New clocks on buildings would have to be digital. Do young people even know how to tell time? Don't they whip out their phones and read the numbers? There are other clocks at the other end of State Street that are quite famous. 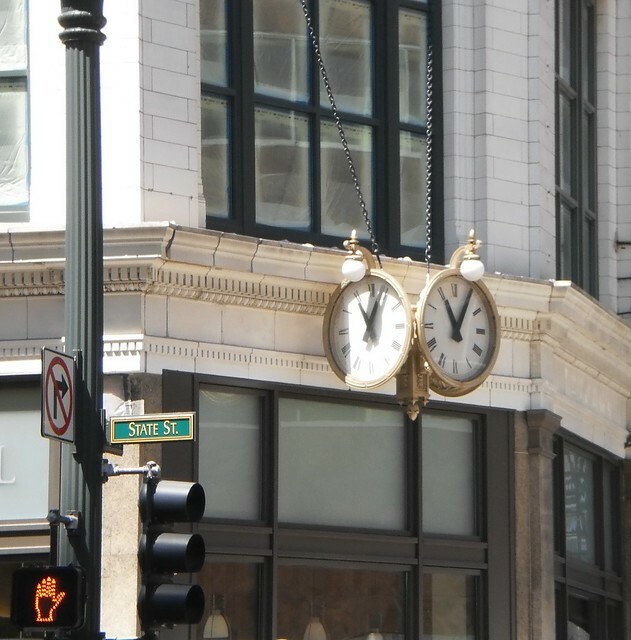 The former Marshall Field State Street flagship store has a clock on the northwest and southwest corners of the building. When I started making friends who lived in the city, it was common practice to say, "I'll meet you under the clock at State and Randolph." These public clocks were once very common throughout cities. Banks usually always had a clock as if banking made you the keeper of the time for the town. Even now, pretty much every bank sign gives you the time and the temperature as you drive by. We've come to expect that of our banking institutions. Don't we notice in April and October when the time changes and the bank doesn't get around to changing the time on their clock? Probably now, it's done automatically and is rarely incorrect, unlike my office computer which isn't usually right until a month after the time change. I don't wear a watch anymore. I have several, including a very lovely one Carole gave me for Mother's Day several years go. The batteries have died in these and I don't really have an incentive to replace them. I am surrounded by the time. There are the little numbers at the lower right corner of my computer screen, the clock on the wall in the office above the microwave, which I can see from my desk and my cell phone. A watch is kind of redundant. Yet, there is something quaint about a clock, an analog clock, mind you, on the corner of a building. It's a landmark. We will lean back in our chairs and talk of a "simpler time", when you paced your life by the clock on the corner of the bank. It wasn't really "simpler", just different. People using the above clock or the Marshall Field's clocks felt just as rushed as we do. They just didn't watch the time digitally. I know, if you're a certain age, you've been singing that song.